Cartref was built in 1882 for Joachim Matthias Wendt, a silversmith and founder of one of the most prominent jewellery firms in South Australia. Wendt came from Holstein, part of Denmark at his birth in 1830. After the Prussian invasion of 1848 Wendt’s dislike of German rule led him to immigrate to South Australia. He arrived in Port Adelaide in 1854 and set up in Pirie Street as a watchmaker and jeweller, moving later to a more prominent location in Rundle Street. He also established outlets at Mount Gambier and Broken Hill. For the Grand Exhibition of 1867 held in conjunction with the visit of Prince Alfred, Duke of Edinburgh, he struck 70 gold and 100 silver medals. 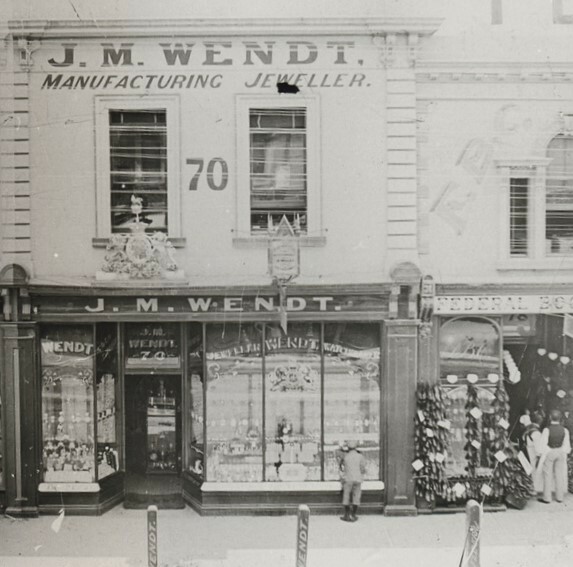 Wendt won appointment as ‘Jeweller to His Royal Highness in the Colony of South Australia’. Many of his works survive today in public collections and are recognised as some of the finest silver work produced in Australia in the nineteenth century. Wendt was involved in other commercial ventures, such as the Theatre Royal built in 1868 with Samuel Lazar and John Temple Sagar, Adelaide Arcade, built in 1885 and the Freemason’s Hall in Flinders Street. Plans for the building of Wendt’s home here by architects Henderson and Marryat were approved in June 1882 and the house was completed that year. Cartref is a typical if rather plain example of a boom period villa in a two-storey asymmetrical form. It is dominated by the classic gable over the rusticated bay window, a return balcony and jettied veranda. All are typical of the Adelaide building style. Wendt died here in 1917. The jewellery business that he began survived for more than 150 years. “Cartref,” Adelaide City Explorer, accessed April 26, 2019, https://adelaidecityexplorer.com.au/items/show/218.